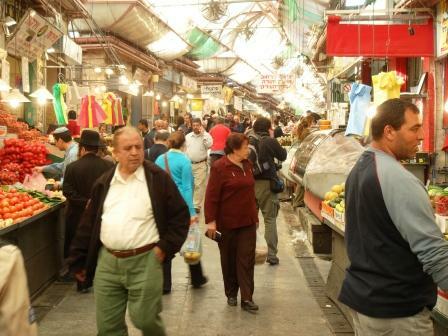 Mahane Yehuda is also known as The Shuk, because it’s the largest shuk in Jerusalem. It takes up a whole small neighbourhood, between Yafo and Aggripas, and is at the heart of a much large shopping complex which stretches up Yafo towards the Old City or up Aggripas, over King George and into the Ben Yehuda triangle. Mahane Yehuda (pronounced Machne) is as much a place to be as a place to shop. 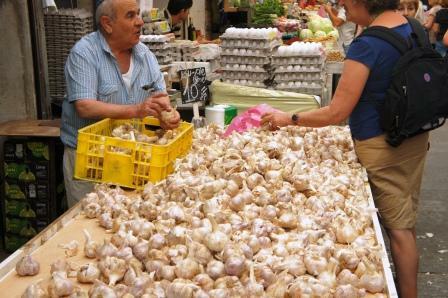 While the prices are about as reasonable as you can find in Jerusalem, it depends on the time of day and week, not to mention the season for produce. Prices are marked with chalk on blackboards stuck in amongst the produce, and what sells for 6 IS (Israeli Shekels) a kilo on Monday morning may be down to 2 IS before the trumpet sounds Friday afternoon for Shabbat. The traditional merchants in Mahane Yehuda yell out their prices and other enticements, like “You can’t believe it” or “Only a friar (sucker) wouldn’t buy.” The frenetic atmosphere probably leads to a lot of tourists buying stuff they don’t have a clue how or where to cook, just for the fun of it. 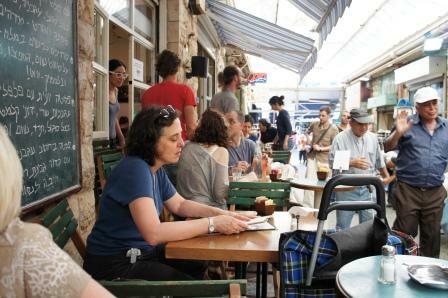 The shuk has become a gathering place of locals from all walks of life . From home cooks to gourmet chefs one can find them, amongst the aisles, seeking the finest, fresh ingredients. The Shuk reflects the multi-cultural Israeli table , one can find the necessary items for many ethnic cuisines including Yemenite, Tunisian, Moroccan , Iraqi, Iranian, Kurd and many more…. in recent times the organic kitchen is emerging too…did you hear about the grannies culinary competition, chefs from the best restaurants in town paired up with grandmothers of different ethnic backgrounds and had a competition for the best recipe learnt from their mothers ?… a delicious and fun event. Enjoy tastings of imported cheeses from France and Italy ( hard to believe they are kosher). Meet the fishmonger who makes his own smoked salmon. Try the best organic humus freshly made daily by the “Dean” of the Shuk, Eli Mizrahi. Enjoy the crunchy sourdough baguettes. Have a break from shopping and enjoy a great coffee and brioche at one of the hip cafes. 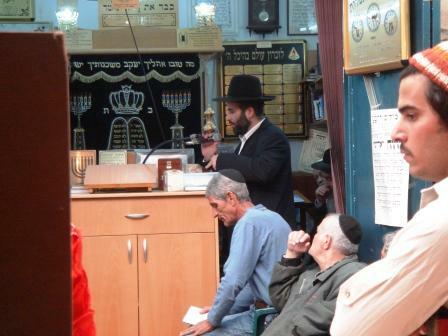 In the last few years there has been a rejuvenation of the shuk. One can find cafes and chic clothing boutiques interspersed amongst the stalls. The children and grandchildren of some of the original vendors have studied cookery abroad and opened up their own special places. This interesting mix of hip and traditional gives the market its unique character. Learn about the secrets of the shuk that only the locals know, the best eateries, “slow cookery” food cooked for hours on kerosene cookers, jazz played on Sunday nights with dancing outside (in the aisles which during the day were filled with shoppers),with a special tapas menu prepared by guest chefs. Visit early Friday mornings. the shuk’s special hours, with its’ unique atmosphere- a great time to meet friends for a coffee and delicious breakfast and do one’s shabbat shopping.